Interested in licensing the music of Jordan Thomas? Jordan Thomas is an exciting songwriter, musician and producer from London. He is a multi-instrumentalist who began his artistic journey as a child by learning jazz piano and performing in a highly energetic Pentecostal Church. At the tender age of 12, Jordan began using music for the sole purpose of expression. Songwriting, a pastime, quickly blossomed into a burning passion. Jordan has been writing with Jess Glynne for her 2nd album. He also co-wrote Jessie Ware’s single 'Midnight', HRVY’s single 'Personal' and co-wrote and co-produced Professor Green’s single 'Count On You'. Jordan Thomas also collaborated with UK rapper Wretch 32 and international dancehall artist Kranium. 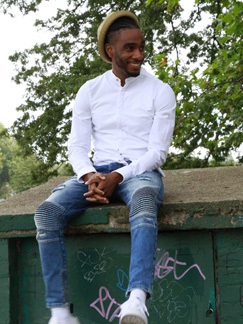 The track, entitled ‘Take Me As I Am’ was both written and produced by Jordan Thomas, and appears on Wretch 32’s third studio album ‘Growing Over Life.’ ‘Take Me As I Am’ tells the tale of one admitting their flaws as an honest foundation of irresistible love, with a hook sweetly sung by Jordan over a quintessentially reggae infused R&B styled production.